This was the first meeting after our recent workshop at the Lawson Lyttleton Stores. It was good to see a few new people turn up – and they hopefully enjoyed the chit chat and discussion of growing plants and saving seeds in our local region. We packed some seeds and talked about how various edibles had done so far this growing season. Summary – terrible season so far for many vegetables with the unpredictable and fairly extreme heatwaves – but a radical change now with the recent cooler heavy rains in the last few weeks that have pushed many plants back into full growth and production. It will be interesting to see how people feel about it at the next meeting on 14th of May as we move into much cooler autumn weather. Main issue this month was the changeover process in the seed library and how to make sure the packing and expiry dates are handled correctly. There were some outstanding nashi fruits to eat along with some very nice mini pancakes and cooked heritage apple and other tasty snacks. As usual the time flew by and we packed up and left… right on time! Thanks to all who came and helped today! The Mid Blue Mountains Seed Savers is affiliated with the Seed Savers Network. 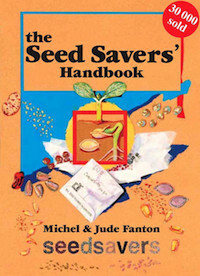 If you want to start saving your own seeds a great starting point is the Seed Savers' Handbook. You can now buy some of our seeds at the Blue Mountains Food Cooperative in Katoomba.